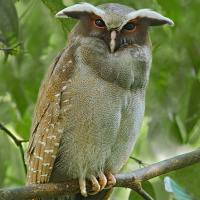 The Crested Owl is a medium-sized owl with large prominent white ear-tufts and white eyebrows. 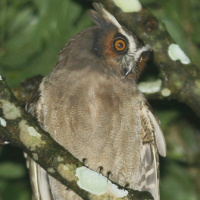 At least two colour morphs may be distinguished - a dark chocolate-brown, a paler rufous-brown morph and a third greyish morph which is considered to be the subspecies stricklandi. Typical call - Crique Limonade amont, Saül, French Guiana. March 2008. CC Olivier Claessens. Description: Chocolate-brown morph: The crown, facial disc, and upper breast is uniform deep chocolate-brown, with the dark rim around the facial disc barely visible. Some individuals have a rufous facial disc. 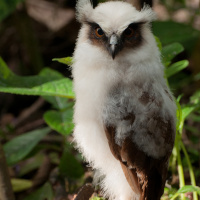 Forehead, eyebrows and most of the ear-tufts are white. Eyes are normally dark brown-orange, but individuals with orange-yellow eyes have been recorded. Bill is yellowish-horn to dark horn. Upperparts are plain dark chocolate-brown, wing-coverts and outer webs of the primary feathers have whitish dots All flight feathers are barred light and dark. Tail feathers are uniform chocolate-brown with very fine darker mottling. The throat is pale buff, while the neck and upper breast is dark chocolate. The rest of the underparts are pale brownish with numerous faint brown vermiculations. Tarsi are feathered to the base of the toes, which are pale greyish-brown. Claws are dark horn with blackish tips. Rufous-brown morph: General colour is pale rufous-brown instead of dark chocolate. Upper breast has a darker brown collar. Size: Length 38-43cm. Wing length 280-325mm. Tail length around 215mm. Weight 425-620g. 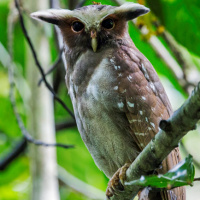 Habits: The Crested Owl is a nocturnal bird, roosting during the day in dense vegetation, especially in thickets along rivers. 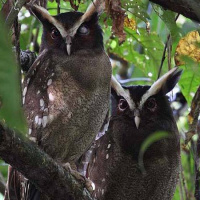 Paired owls often roost together. 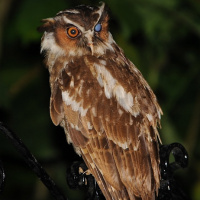 If disturbed at roost, the owl will become very slim and erect the ear-tufts high. At dusk, singing commences from perches in the middle canopy of the forest, and may continue throughout the night. Voice: A somewhat frog-like croak that begins with a stuttering rattle, then accelerates to a deep, purring, guttural and rough croak - k-k-kkk-krrrrrrao. At a distance, the lower first part of the call may be inaudible. The song is uttered at intervals of several seconds. Hunting & Food: Little information available. Feeds mainly on insects, but likely also small vertebrates. 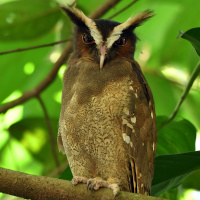 Breeding: The breeding biology of the Crested Owl is little known. Normally breeds in the dry or early wet season. Nests in natural holes in mature trees. Habitat: Lowland rainforest with undergrowth, mainly in primary forest but also second growth. Ranges from sea-level up to about 1200m in Guatemala and up to 1950m in the cloud forest of Honduras. This owl prefers to be near water. 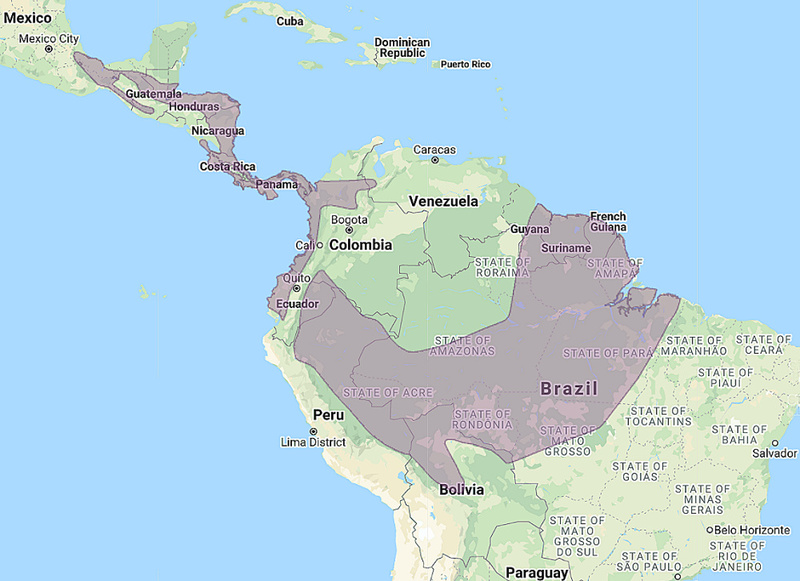 Distribution: Locally from south Mexico through Central America to Venezuela, Surinam, the Guianas, Amazonian Colombia, Ecuador, Peru, Brazil and Bolivia. Status: Uncertain. Common in undisturbed forest. Original Description: Daudin, Francois Marie. 1800. Traité élémentaire et complet d'Ornithologie, ou Histoire Naturelle des Oiseaux, 7, p. 207. 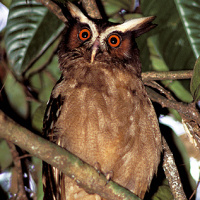 See also: Other owls from North America, Central America, South America, Genus: Lophostrix. Page by Deane Lewis. Last updated 2015-11-12.